YouTube recently gave me some video suggestions that I watched. Basically, it was the worst draft picks of all time, worst #1 picks, best underrated draft picks, etc. 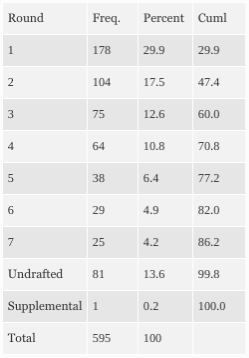 Is there any statistics that show high draft picks improve a team in the short and/or long term? Ive been googling, but I cant find anything. Maybe Im using the wrong search terms. Picks in higher rounds do better by staying in the league longer, starting more, and being more likely to be Pro-Bowlers. -Undrafted players (14%) were the 3rd most likely group to comprise 2014’s starters…only behind 1st round (30%) and 2nd round (18%) picks. 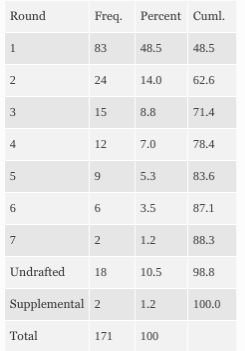 -2nd and 3rd round draftees from 2010 have started roughly 34% and 36% of all possible games, respectively. 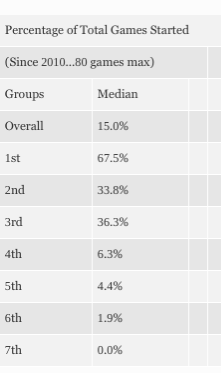 -The median percentage of games started for players drafted in rounds 4 through 7 from the 2010 draft was extremely low, never rising above 7% of games played over the last 5 years. -Lastly, 21% of All-Pros from this period came from either the 3rd, 4th, or 5th round. Not the answer you're looking for? Browse other questions tagged statistics draft or ask your own question.